Combine a sightseeing trip on the water with a hike to Skageflå, the best-known of the fjord farms along the Geirangerfjord. Norway’s King Harald and Queen Sonja celebrated their silver wedding anniversary at Skageflå in 1993. The Queen also unveiled an official UNESCO World Heritage plaque here in June 2006. 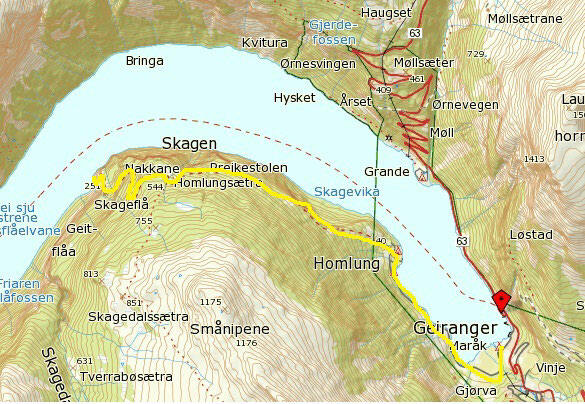 Starting point of the hike is Skagehola, which is only reachable by boat. 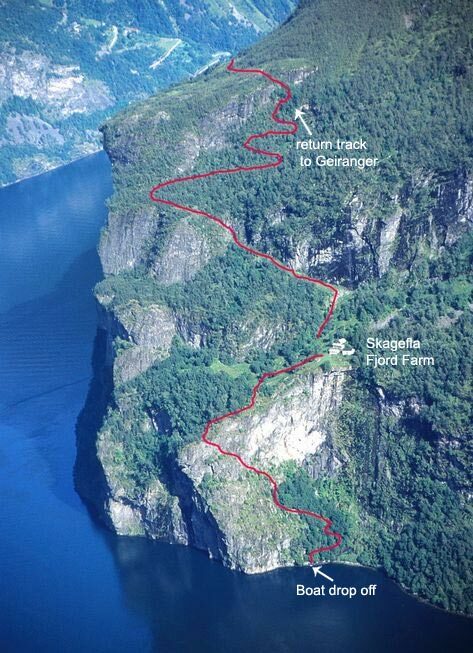 The path up to Skageflå is steep and demanding but you will be treated with breathtaking views to the Geirangerfjord and the waterfalls "The Seven Sister" and "The Suitor". The farm itself perches on a mountain ledge approximately 270 m above sea level. Our sightseeing boat MS Geirangerfjord ("traditional vessel") drops you off at the starting point Skagehola. 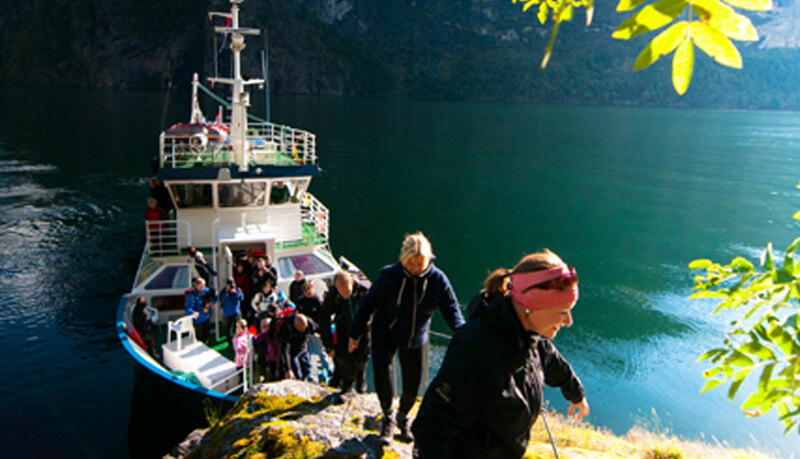 The drop-off service is included in the fjordtour with our sightseeing boat. The MS Geirangerfjord stops at Skagehola at the end of the tour on the way back to Geiranger. From Skagehola it takes about 45 minutes to go up to the farm Skageflå. After taking a break with a fantastic view you can either hike back to Geiranger (around 4 hours) or you go back down to Skagehola and use the pick-up service with our Sightseeing boat. The pick-up is as well included in the ticket for the fjordtour. Please note: Only the sightseeing boat MS Geirangerfjord ("traditional vessel") offers the Skageflå drop-off and pick-up service. Safety note: All hiking is at your responsibility. Use common sense when you are in nature. Only go on the hike with firm footwear (hiking boots) and enough to drink.